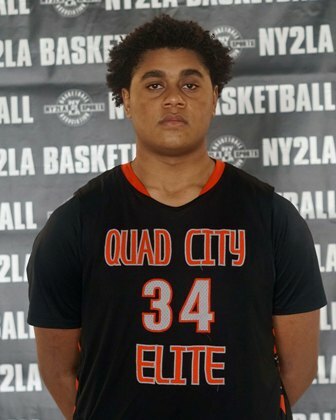 The class of 2020 already has a host of blue chip prospects at the top of boards from the Midwest and while some of the bigger names like Jalen Suggs, Jalen Johnson, Adam Miller, etc. tend to start most conversations regionally in that class, there are a number of talented prospects who have yet to hit their stride fully that are delivering at a high level this season. Case in point is powerful interior prospect Devon House of Sterling Newman High School in Illinois. Equipped with a strong 6-7 plus length 225 pound frame, House is a powerful interior prospect with solid instincts and a nice feel for a young big. He is comfortable playing with his back to the basket, he has some solid footwork and post moves for a young big, and he has the ability to step out and face up at the mid-range level or beyond the arc on occasion. On the glass he has a nice feel and when active he has the ability to control the boards on both ends. He moves inside the paint well and while still needing to develop laterally and vertically to take the next step as a prospect, House is a powerfully intriguing young prospect who is starting to show dominant potential in flashes. Earlier this month the young sophomore posted in impressive 40 point effort in a Sterling Newman victory once again displaying the impressive dominant potential he possesses. Northern Iowa, Northern Illinois, and Western Illinois are a few of the schools starting to kick the tires on House. Still developing across the board physically and skill wise, expect his recruiting trail to continue to grow over the next 12-24 months as he’s quietly become a very interesting prospect to watch develop in the 2020 class. House plays with the Quad City Elite program during the grassroots travel season.